A cage encapsulating inorganic materials like rock and concrete, gabion walls can be an aesthetically pleasing, inexpensive retaining or privacy wall solution in your landscape design. What’s the history of gabions? Gabion walls (from Italian gabbione meaning "big cage”) are more than a trend born of recent times. They've historically been more function than form, commonly used in in civil engineering, road building and military applications. Their use dates back to the 19th century, having been built to stabilize shorelines and streams and divert water. According to Wikipedia, Leonardo da Vinci designed a type of gabion called a Corbeille Leonard for the foundations of the San Marco Castle in Milan. 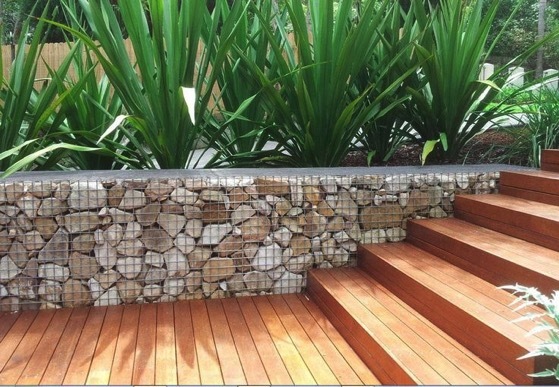 What aesthetics do gabions work best with? Over the past decade we’ve seen gabions used more commonly in modern, industrial and minimalist landscape designs, though they shouldn’t be limited to just those. They also can be integrated in more rustic designs. Given their history and functionality, we think you should feel good about incorporating one in yours. Above: A Yardzen design in Marin County incorporating a gabion used for form and retaining function. Below, the design coming to life. What are gabion cages made of? Gabion cages vary, but most commonly they’re made of sturdy galvanized or stainless steel wire. Many online and local retailers sell the cages pre-made, and you can work with your landscape contractor to choose the right cage for your project and budget. Affordability. Generally less expensive than other retaining solutions since they don’t require a foundation. Aesthetically pleasing. Still not very common, and surely a conversation starter. Environmentally friendly. Use filler material that’s recycled or native to your property to cut down on carbon emissions. Get your design started today and ask your Yardzen team about a gabion wall at your property.